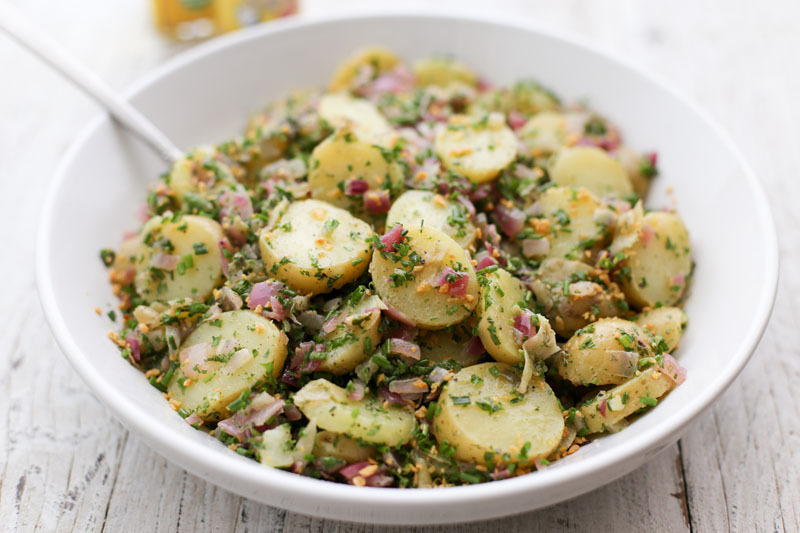 Our tangy take on potato salad is sure to win you tons of fans. You won’t find any gloppy mayonnaise dressing here! Instead, we steam new potatoes (the ones with red or pale yellow skins), then slice and toss them in a warm, herby vinaigrette. You’ll love the balance of flavors. Garlic Gold® Oil and sautéed red onions provide a mellow, rounded sweetness, which is offset with spicy Dijon mustard, tangy apple cider vinegar, and a salty pop of chopped dill pickles. Tons of fresh chopped parsley and chives make it taste fresh and bright, and a final sprinkle of Garlic Gold® Nuggets makes everything come together! Serve this at a picnic, potluck, BBQ, or for any summer meal. It’s an awesome accompaniment to grilled meats, especially chicken, pork loin, or long-smoked brisket. While the potatoes are cooking, heat the olive oil in a large skillet over medium heat. Add the red onion and sauté until softened but not browned, about 10 minutes. Turn off the heat under the skillet and add the vinegar, mustard, pickle, pepper, and salt. Stir to combine and set aside. While the potatoes are still hot, slice them into 1/4-inch rounds. Add them to the skillet, along with the parsley and chives. Stir gently until the potatoes are coated evenly. 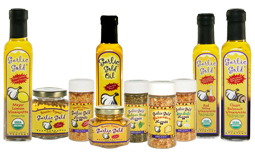 Top wih Garlic Gold® Nuggets and serve warm or at room temperature.